Develop products for more, smaller meals and add longevity-promoting ingredients. Grandchildren are a darn fine invention. They make us see the future as a bright beacon of hope. They also are vivid and concrete displays that the years have gained on us. We want to be able to trot along the scooter as that darling dervish heads towards the corner where he knows he has to stop. We want be able to wrestle with the rug rats or simply climb into bed and read them a story. Eating a balanced and healthy diet are extremely important as Americans age and reach for even simple goals — such as trotting, wrestling and even climbing into bed with those grandchildren. Dr. John Whyte, M.D., the chief medical expert and vice president of health and medical education at Discovery Channel, shares a goal for all people, but especially for those for whom the years are creeping up. "It's not just what you exclude, it's what you include," Whyte says about moving onto a path of healthier eating. "We need to include more fish, fruits, nuts, whole grains and low fat dairy." Having a better life through a better diet doesn't take miracles, he says. "When people ask about eating healthier, I tell them about this amazing food. It's called a blueberry. It has vitamin C, antioxidants and natural sugar. We need to eat more blueberries and less candy bars." Whyte also suggests more vitamin D and B12. Whyte, author of the recent "AARP New American Diet: Lose Weight, Live Longer," also suggests it might be a good idea to change our ideas on food ingestion. He says people should add a couple of "meals" a day. "Eat less, but more often, as in three meals and two healthy snacks a day. It's almost like grazing." He adds that our meal planning should be adjusted to our actual lifestyle. A non-active person should aim for 1,600 calories a day, a person with average activity 1,800 calories a day and a very active person can burn 2,000-2,200 calories a day. Many people skimp on breakfast, when this is the time of day when we should be taking in food since we are going to be most active and physical. Sitting down for dinner, often the biggest meal of the day, is when people are gearing down and becoming less active. "We are many times getting our largest amount of calories at night. We need to begin our day with a much healthier breakfast," he says. A healthy mid-morning and mid-afternoon snack, such as a handful of almonds, will cure hunger pangs and provide the desired nutrition, he adds. The next few decades will see great changes in the American population. One in five resident of the U.S. will be age 65 or older in 2030. By that time, all of the baby boomers will have moved into senior citizenry (65 or older). The baby boom generation, people born before 1965, is the single largest consumer group in America. In 2010 the U.S. population 65 and older was estimated at 40,229,000, but it's projected to reach 88,547,000 in 2050. As the population ages, the significance of consumers over the age of 50 will grow in importance. Already in the U.S., the Baby Boom generation accounts for the largest share of sales of any generation across most product categories. With fiber, antioxidants, whole grains, zero saturated fat and low sodium, Kellogg's FiberPlus is a recipe for fighting the battle against aging. AC Nielsen's report, "The Global Impact on an Aging World," is based on findings from an online survey conducted in more than 50 countries. It brings much to light about retirement and other sentiments around aging. The one thing marketers must accept for certain about baby boomers is that they will redefine what it means to be old, just as they redefined what it meant to be young and middle-aged. And they will not allow themselves to be ignored. Three of the most important health and well-being areas of interest for this group are battles to retain mental sharpness, not be slowed down by arthritis and to keep cholesterol and blood pressure in check. Increasing the quality of life and living longer are very important. It is suggested in the Dietary Guidelines for Americans that aging folks should have six to seven ounces of grains each day in a 2,000 calorie diet. Half of these should be whole-grain cereals, breads, crackers, rice and pasta. It is also important to understand what you are eating, such as the fats you are consuming. Most of the fats should be polyunsaturated or monunsaturated, coming from fish, nuts and vegetable oils. "In general," said Susan Nitzke, professor emeritus in nutritional sciences at the University of Wisconsin, "fats that are liquid at room temperature are better for you. Oils from fish, nuts and seeds are healthy for you." Monounsaturated fats are found in olive oil, avocados, salmon, walnuts and flaxseed. The fats from these sources can protect you body against heart disease and help control LDL or bad cholesterol and raise your HDL or good cholesterol levels. "I don't understand people who say, ‘I don't have time to read product labels,'" Nitzke said. "I am an avid label reader. You have to take the extra few minutes. If you don't look at labels you are missing important health and nutrition facts." She suggests one way to use the nutrition facts on packaging is to read the percent of daily value for the various nutrients. Look at how many grams of a nutrient are in a serving, and then compare to the recommended daily value (or percent), which is how much you should have for the whole day. Brand loyalty also can help in this area. If you find nutrients in one brand of lunchmeat, turkey for example, that meets your goals, other luncheon meats from that brand often will match your goals. Eating smaller and more often only works when you become a label bookworm. Grabbing a yogurt from the fridge may seem perfect for that mid-day snack, but the nutrition facts will unveil whether you are getting more calories than if you had decided to grab a handful of chips. Antioxidants are important for your diet. Think of them as soldiers fighting the battle for you. Antioxidants reduce the number of free radicals in your body, which can cause damage such as cancer and heart disease. Antioxidants reduce the damage done by other foods and the aging process itself. "Consumers view blueberries as healthy because they know and trust them, often from lifelong association," says Jeannette Ferrary, a spokesperson for the U.S. Highbush Blueberry Council, Folsom, Calif. "Almost all diet programs, trendy and traditional, include blueberries. Virtually fat-free, low in sodium, carbohydrates and cholesterol, blueberries are a delicious source of fiber, minerals, folate and vitamins." In a recent study testing the effects of blueberries, Ferrary said, preliminary results show that people who ate a cup of blueberries a day performed 5-6 percent better on motor skills tests than the control group. The compound that appears responsible for neuron protection, anthocyanin, also gives blueberries their color and might be the key component of the blueberry's antioxidant and anti-inflammatory properties. Blueberries, along with other colorful fruits and vegetables, test high in their ability to subdue free radicals. These free radicals, which can damage cell membranes and DNA through a process known as oxidative stress, are blamed for many of the dysfunctions and diseases associated with aging. 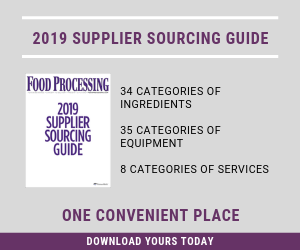 "Food processors can make use of this ‘blue advantage' by incorporating blueberries in their convenient and always-available forms: whole, diced, fresh, dried, freeze-dried, puree, concentrate or juice," she says. Whole grains in products are growing rapidly, according to the Whole Grains Council. In the U.S., consumption of whole grains increased 20 percent from 2005-2008, and consumers worldwide are beginning to understand the importance of enjoying more whole grains. Sixty percent of Americans consumed at least one whole grain product during a typical two-week period. Keeping the brain healthy is vital as people age, and omega-3 fatty acids can improve focus and decrease the risk of Alzheimer's disease. Adding a couple of helpings of fish to your menu will help, and there are ways to get omega-3s if you are not a seafood fan. Omega-3s are fatty acids essential to human health and play an important role throughout the life cycle. Populations that consume large amounts of fish tend to have a lower incidence of heart disease, cancer and many other chronic diseases. DSM Nutritional Products, a Dutch ingredients supplier with U.S. headquarters in Parsippany, N.J., has amassed a broad portfolio of omega-3 products, having acquired North America's two leading providers about 15 months apart. First it was Martek Biosciences Corp. of Maryland in early 2011, then Ocean Nutrition Canada in mid-2012. They form the marine bio-lipids leg of a global Nutritional Lipids platform. The two acquisitions were added to DSM's ROPUFA line of marine-derived polyunsaturated fatty acids. DSM also added Fortitech Inc., a U.S.-based maker of nutrient premixes, at the very end of last year. "Fish is beneficial to health as it is rich in omega-3 fatty acids, both eicosapentaenoic acid (EPA) and docosahexaenoic acid (DHA), also known as 'long chain omega-3s," says DSM marketing materials. These two important essential fatty acids are important for health and are associated with a healthy heart and cardiovascular system, as well as brain and eye health. "When people want to increase their intake of fish oils and it is not possible or preferable, then long chain omega-3 supplements and foods enriched with long chain omega-3s become an important source of these vital nutrients." See what else Cargill has in store in its Formulating Ideas blog on FoodProcessing.com. Less salt and sodium also are high on the health list for seniors. Potassium chloride is the most widely used substitute. Variants are marketed by Cargill Inc. (SodiumSense and FlakeSelect), Nu-Tek Salt (Advanced Formula Potassium Chloride), Morton Salt (KaliSel) and Wixon (KCLean Salt). Dr. Paul Lohmann Inc. takes a different approach, mixing various mineral salts to come up with lower-sodium salt products under its LomaSalt brand. ICL Performance Products takes sea salt derived from Israel's Dead Sea for a naturally low-sodium salt called Salona. All are good additions to a product developer's toolbox, especially since studies have shown that 75 percent of a consumer's sodium comes from prepared foods. Most consumers know adding fiber to your diet helps to avoid constipation, but it also lowers the risk of chronic diseases and keeps you feeling fuller longer. And getting fiber doesn't have to be gnawing on roughage. It can be like eating ice cream or even snacking. Inulin, a dietary fiber from chicory root, is easy to use because it is invisible in water and has many applications. Cargil's Oliggo-Fiber inulin is used in applications ranging from beverages to ice cream, and the company in moving into the areas of snack foods such as pretzels and drink mixes such as a mango flavored white tea mix. "Inulin can be added to all sorts of things as a source of dietary fiber," says Deborah Schulz, product manager for Cargill Health and Nutrition, Wayzata, Minn.
"Inulin helps replace the fat and sugar in many products. In baked good it can help replace high intensity sweetners and still have the bulk that sweetners provide. You can take out the sugar in a cookie, for example, but still look like a cookie with our dietary fiber source." She also notes that the prebiotic properties of inulin help maintain the digestive tract's good bacteria. Whether it's playing with the grandkids or rafting the Colorado River, the aging population wants an active and healthy life. Food processors can help make consumers with nutritious choices.